Taking a hill in the middle of town and proclaiming it an independent state obviously wasn't such a bright idea now was it? Now you'll have to pay the prize. The army has sent one of its finest commanders, General Taylor, to deal with your little rebellion. Survive the onslaught if you can, and post your records as a comment for this arcade style Defend the Spot minigame! • 16 levels to beat. • Strategic gameplay; lots of thinking and micromanagement needed. The thread is old by now and shouldn't be bumped, but if you want you can see a few people's records and try to beat them anyhow. • Spawn point blocking disabled. • Better and more hints. • A few spelling misses fixed. • Minor lil' buglets fixed. Words cannot describe how much I say yes. Try 1: Level 11, 482 Kills. Amazing job, Lord Basse! This is one for the history books. Keep up the great work, I have no tips for ya! First, this mini scenario is a lot of fun. The arcade style has a fast tempo, and little elements the author has included like the dialogues of dying heroes are fun too. For light entertainment, this scenario is hard to beat. Unfortunately, although there is no lag, there are some bugs worth mentioning that drag down the score. But overall, the scenario is extremely entertaining. The 'rewards' cause Noah at one point to revert to his default name and stats, although I am unclear why this is. This is quite important as it makes him many times more likely to be killed, and he is an important hero. Despite the lack of difficulty dynamics, the arcade style leaves little to be desired. The pace is frantic and the attacks are intense, so that a good challenge is presented. It is easy enough that with the right tactics it is possible to go a long way through the levels, while hard enough for this to be worth achieving. Unfortunately, the bug that affects Noah is a problem for balance. For a five to be awarded, this would need to be corrected and difficulty dynamics might be necessary too or some may be frustrated. The concept is extremely simple and generic, but the execution is great, and the author does enough to receive a high score in this category. The story, the setup and little touches in the gameplay make this stand out. The map is extremely small, in accordance with the author's intentions. On such a small canvas the author does well in making the design appealing, although there is little room for anything outstanding. The map also fits well with the rest of the design, although there are a couple of minor defects. The most noticeable is that the enemies uselessly attack walls on cliffs, which affects gameplay as the enemy does not interact with the map quite as intended. With this style, the story is almost an optional extra. However, the author has made an effort to come up with an interesting premise, and the story is well told. Aspects of characterisation are good too. More importantly, the intructions are adequate and serve the design well. For such a scenario, it would be difficult to score more highly in this category as the story is not the main focus. It flowed from one wave to the next, giving the player many ways to defend and attack the enemy. The idea is a lot like the 'defend your base' genre. 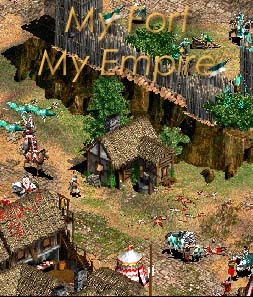 But it gives the genre justice by providing you with more than just troops. Defenses, height advantages, and kill-count upgrades add to the fun! While there wasn't a lot of space to move, it gave the player enough to do what they were supposed to do, and provided useful points and areas for the player and enemy to do battle. Oh, God, I couldn't stop laughing at the beginning! "We're screwd aren't we?" "Yep." Funny! and the rules were explained well. I knew what to do with everything as soon as the game started. It was a neat little project! I liked the fact that it loosened up the tension with enough humor at the beginning to really enjoy the battles. This is a really great peice of work, and I hope to see more great material from you! I just went trawling through the games and found this jewel :3 It's amazing! Getting to level 8 or 9 can be done with nearly no strategy whatsoever - after that, knowing counters (strengths vs weaknesses) and a little bit of micro really comes into play, as it ramps up quite a bit after that. The early levels were generally easy for the troops given and can be done by just sending troops out, rinse and repeat as healing is entirely done before the next wave arrives. I did find that part slightly draggy, but as it did not take away too much from the game, it still gets a 5. The map was well designed and complemented the feeling of the game. Having the fort on a hill just adds to that "last stand" feeling, and during the game I didn't feel as if the map was constrictive/restrictive at all, despite it being only 15x15 - everything that has to be done can be done, and everything that can't be done is extraneous anyway. Wonderful, despite, or perhaps because, of its small size. Instructions were very clear. Storyline was novel and interesting - can't really write more without spoiling it, heh. But it resonates, perhaps because it's something that most people can relate to. It adds a new dimension to the story outside of the game, and IMO is the best part of the scenario. 1st try: Level 15, 646 kills.